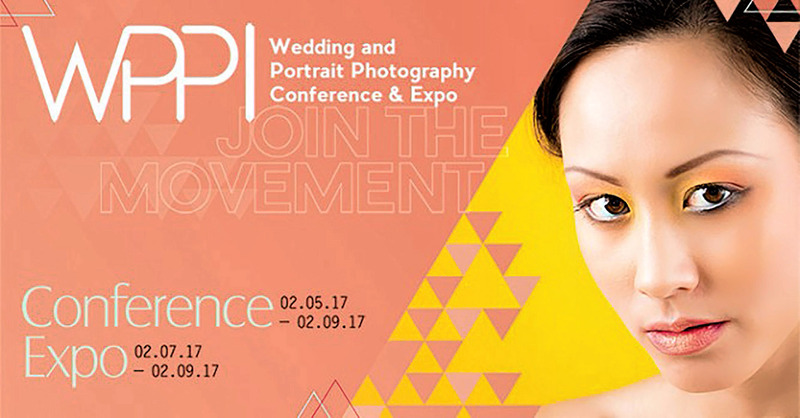 More than 230 leading manufacturers of photographic, video, and other visual communication hardware, software and professional services will demonstrate the latest products and services to thousands of photographers and filmmakers attending the annual Wedding & Portrait Photography International (WPPI) Conference + Expo at the Las Vegas Convention Center from February 5-9, 2017. With more than 200 educational seminars, workshops, photo walks, and large exhibition hall, WPPI has become the largest and most anticipated event for wedding and portrait photographers and filmmakers in North America. Several Photofocus team members will be at the show. Be sure to watch our Twitter feeds and Facebook timeline to see if there’s a chance to hang out. “WPPI continues to be the most anticipated event and destination for wedding and portrait photographers to be inspired by new creative techniques, business practices, and innovative technologies,” said Mike Gangel, sales director for WPPI, PhotoPlus, PDN and Rangefinder magazines. This year, attendees will see dozens of new products and services for the first time and have the ability touch, try and compare everything that’s new all in one place. Imagine having the opportunity to experiment with many new imaging hardware and software products that are designed to help photographers improve their workflow, expand their skill sets, generate additional revenue, and build business. Now imagine speaking first hand with representatives, asking questions about these new products and services. This is all designed to give you the ability to make an informed decision on what products or services are best for you. Bay Photo’s new Xpozer Expo Display Kit is the perfect solution for the photographers exhibiting their work. Consisting of nine 24×36 Xpozer Prints, this arrangement includes the hanging hardware specifically made to easily display multiple prints on pipe and drape. Each Xpozer features a vivid, sharp photo print paired with a revolutionary mounting system. The Expo Display Kit is low cost, portable, lightweight, quick to assemble, and easy to update. Photographers will not only save time, but money, as the bundle is priced 20% lower than the individual print prices. To exceed expectations, choose the Xpozer Expo Display Kit for your next exhibition. Broken Fence Studios, a trusted, family-owned design partner, is excited to announce its new Photographer Profit Formula, a step-by-step guide to adding more referrals and more money to your photography business with less effort and frustration. Stop by booth 1333 for a complimentary copy and check out their latest album samples, and much more! With its hand-crafted wood covers, genuine artisan leather spine, and distinctive elements, the Antique Collection is the ultimate in old world charm and will visually enhance your albums. Inside you’ll find Floricolor’s signature gutterless, lay-flat binding on your choice of archival-quality photo paper for stunning panoramic spreads. The Antique Collection includes both album and box, available in two finishes. Choose from five genuine leathers for the spine and 12 design options for laser engraving. Freedom Edits offers a new take on traditional post-production image outsourcing. Featuring your own design team who know the ins-and-outs of your entire editing process, this personalized and unique approach means photographers receive superior quality photos exactly the way you want them. Freedom takes the burden of editing backlog away from photographers while fulfilling all their album design needs. Freedom Edits will launch its new album production service in March so photographers can easily and efficiently outsource their entire post production needs. Fundy Software is announcing that professional design in Fundy Designer will incorporate professional retouching applications with Perfectly Clear. The partnership now allows the ability to design albums and wall art, run client design consultations and retouch – all in one powerful application. Coming as a free update to Fundy Designer v7 in March 2017, this new feature will give professional photographers a more streamlined workflow by enabling them to sort all of the photos that need retouching and complete the process with a few simple clicks. RFS2.2 transmitters bring broncolor HS technology to the Swiss lighting manufacturer’s Siros and Move strobes; giving photographers the ability to sync flash at shutter speeds up to 1/8000s. Available for Canon, Nikon, and Sony cameras, RFS2.2 transmitters can control power output for all RFS 2 enabled broncolor strobes. broncolor HS is available on Siros 800L, 400L, and Move 1200L battery strobes, and Siros 800S and 800 WiFi/RFS 2 plug-in monolights. RFS2.2 also features a durable metal hot shoe, an additional female shoe for syncing additional transmitter systems. Strip Grid 5:1 from broncolor introduces a new option for creative light control. Traditional metal honeycomb grids typically create a rounded light shape, but the Strip Grid 5:1 outputs a unique soft rectangular pattern from a circular reflector. With sturdy all-metal construction, the new Strip Grid 5:1 fits the P70 reflector, compatible with broncolor’s extensive line of studio and location strobes. Creating characteristics of light previously limited to conical or optical reflectors, the new Strip Grid 5:1 just adds to broncolor’s wide lineup of light modifiers for the modern image maker. Recent updates to the award-winning S1 have increased camera compatibility, added simultaneous HSS and TTL, and expanded the power range to 9 stops! Looking for portable LED’s? Their LEDGO lights feature variable color temperature, 95 CRI, and 40,000fps flicker rate; perfect for stills and 4K video. The new LED Ring Light utilizes soft-light LED technology to create flattering light on your subject without the blinding glare of traditional LED ring lights. The VersaTile is an affordable, flexible, low-profile LED mat that allows users to quickly and easily transport, set up, and use their lights, even in tight quarters. Stop by their booth for hands-on demonstrations and incredible show specials. The travel friendly PhotoStream RL 150 is a lightweight, streamlined airline carry-on designed to protect your valuable photo and video gear. Weighing in at only 8lbs with a 7.5-inch depth, this roller features an armored exterior and flexible interior to protect and organize, while vibration-absorbing wheels ensure a smooth glide and long-lasting durability. Easily carry one to two pro DSLRs with up to a 70-200mm f/2.8 lens attached, up to eight lenses and speedlight, a 15-inch laptop, and more! Manfrotto Distribution will feature the following products at WPPI 2017: Manfrotto Befree Live- the most compact & lightweight travel video kit designed to support CSCs and DSLRs; XUMEquick release adapters, which enable photographers to quickly connect filters to their lenses; the new XPRO Monopod+ family for Photo & Video; several new bags including the Pro Light Reloader-55 Roller & 3N1 Backpacks; Advanced Backpack and Shoulder bag for CSCs; Street Backpack, Shoulder bag and Messenger for CSCs & the Lifestyle Windsor Collection; Gitzo Systematic Tripods & Monopods; plus Generation X – travel and studio lighting from Bowens. Smart Selfie Print Station from Mitsubishi is an accessory designed for the Mitsubishi CP-D90DW, enabling users to easily print wirelessly from mobile devices to the Mitsubishi CP-D90DW dye sub printer. Users connect to the SSID broadcasted by the Smart Selfie Print Station, open their browser to be automatically directed to a web-based program instructing them to select photos from their phone gallery or shoot a new photo for printing. Three easy steps with no new app to download or install, you can add more fun to your photography package and allow guests to print photos taken at your wedding instantly. Long a staple in the arsenal of professional photographers, Nikon’s upgraded AF-S NIKKOR 70-200mm f/2.8E FL ED VR is a versatile and powerful tool ready to help capture picturesque destination weddings or stunning portraits with masterful precision. Setting a new standard for fast telephoto zoom lenses, the new 70-200mm features a wide f/2.8 constant aperture and adds the latest innovations in imaging technology to Nikon’s legendary NIKKOR lens legacy to provide a magnificent optic for the most discerning photographers. For storytellers who want to capture challenging subjects like cityscapes, interiors or architecture, Nikon’s latest perspective control (PC) lens, the ultra-wide angle PC NIKKOR 19mm f/4E ED, is a new tilt shift offering that will help photographers master perspective, focus and depth-of-field. Tilt the lens to sharpen focus throughout the scene or create a miniature effect or shift to create panoramas and eliminate converging lines. As the first NIKKOR PC lens that allows the direction of tilt operation to be made parallel or perpendicular to shift, the PC NIKKOR 19mm allows users to fulfill their creative vision. Photobooth Supply Co. will announce a new product that will reshape the future of photo booths. This product is built around the idea of total integration, and features software and hardware working in concert. It is easier to set up, easier to run, and more reliable than any photo booth before it. It will feature a new printing experience and a new visual design. Pr-orders will be taken during the Expo before its public debut later in the year. Photoflashdrive.com, source of Custom Packaging and USBs for the photographic industry is now offering Custom Presentation Boxes (8×10 or 11×14 sized) created to hold twenty Slip-in Mats and a Custom USB all-in-one easy-to-display set. Available in Rustic, Premium & Reclaimed wood finishes, and an elegant black matte Signature Style Presentation box, the selection offers professional photographers a great alternative to albums. All Boxes and USBs include custom labeling for a great branding opportunity. SmartSlides is an online slideshow maker for professional photographers and helps them tell stories with photos and music in a simple and beautiful way. SmartSlides stands out among other builders for its simplicity and ease of use. Making beautiful slideshows is now a quick and intuitive process. Ready-made online slideshow pages display your photos in a timeless way, and their licensed and carefully curated music library makes the creation of slideshows truly effortless. The Grunge Classics by Savage are premium backdrops that feature a unique printed texture on the front and a beautifully dyed mottled finish on the reverse side, allowing photographers to easily switch from grunge to classic background styles in one photo shoot. Seven styles are available and sized to 5×7-inches. They are also available as a kit with an 8-foot aluminum stand. ShootDotEdit announced it has acquired Fotoskribe, the leading expert in blogging as-a-service for the Professional Wedding and Portrait Photographer. Over the years, Fotoskribe has earned the trust and reputation of creating best-in-class content and image publishing for its customers. Fotoskribe specializes in matching the voice and style of each photography business they serve. ShootDotEdit has been inspired by Fotoskribe’s repeated ability to get Google’s attention and thereby increase the SEO rankings of its clients. For these reasons and many others, a spokesperson for ShootDotEdit said, it made good sense to align with and purchase them. SKB Cases and Think Tank Photo teamed up to develop a high-quality line of Photo/Video hardshell cases to provide the ultimate in protection and convenience. This co-branded line of Flyer Series Cases features SKB’s indestructible waterproof iSeries hardshell cases with premium interiors designed by Think Tank Photo. These exclusive interiors provide durable, fully customizable divider options for camera/video equipment and accessories and new lid organizers, a wrap-around hard case cover with a shoulder strap and zippered pull-out divider case and a backpack designed to fit the SKB rolling carry-on case (3i-2011-7B). Flyer Series Cases are available in four popular sizes and backed by SKB’s Lifetime Warranty. The SpiderLight Holster just might be the best holster available for mirrorless and lightweight pro cameras. Designed specifically for mirrorless cameras and small DSLRs, this camera holster is lightweight, durable and extremely versatile and the perfect companion for anyone who wants an easy draw-from-the-hip, no strap solution to take their camera anywhere (literally). The Signature Series from Think Tank is a modernized version of the classic shoulder bag. Whether you are a young urban professional or corporate photographer, the Signature shoulder bag is as fashionable as it is functional. Hand sewn advanced fabrics blend weather protection and durability with the classic feel of fine wool. Modern wool-like fabric, genuine leather detailing and antique-finished metal hardware adds character and stands up to the rigors of a photographer’s daily use. Also includes a dedicated laptop/tablet compartment: Signature 10 fits a 10” tablet; Signature 13 fits a 13” laptop. You can only take a rolling bag so far. When the terrain becomes uneven, simply convert the Airport TakeOff to a backpack so you can carry your gear to the location. Sized to meet the needs of a traveling professional, the Airport TakeOff fits most U.S. domestic and international airline carry-on requirements. Key Features also include an integrated comfortable shoulder harness and padded back panel. A large front pocket fits up to a 17” laptop and a 10” tablet. Inside holds up to a 400mm f/2.8, two standard bodies and assorted lenses. Additional information and a complete schedule of seminars and activities are available online at wppionline.com.